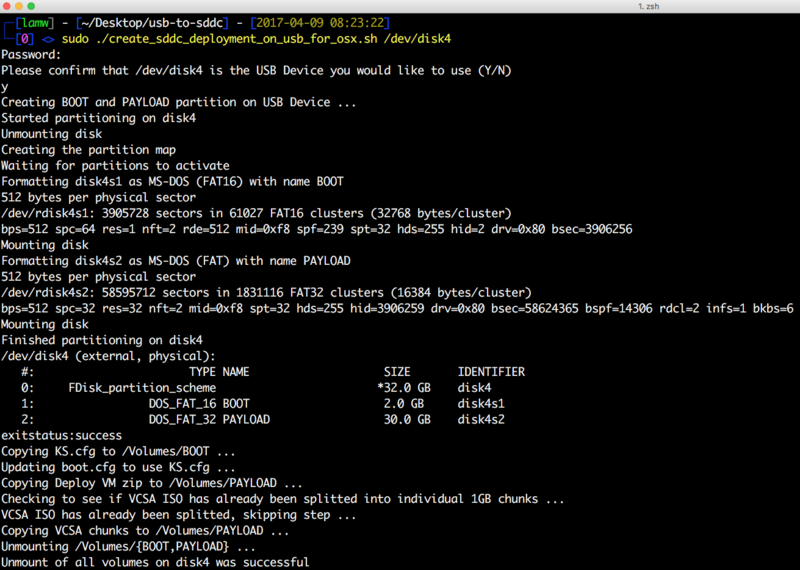 Step 2 - Change into the usb-to-sddc directory or extract the contents if you downloaded the zip file from Github instead. Step 3 - Download all the files listed in the Software Requirements above to your local desktop. Step 4 - Open the KS.CFG using your favorite text editor such as vi, Visual Studio Code, etc. Search for the following tag in the file # ---> START EDIT HERE <--- # which should be located on Line 10. VSAN_DISK_TYPE - Defines whether you have a Hybrid or All-Flash vSAN setup based on your physical disks. The valid values are HYBRID or AF. PHOTON_IP - This is the IP Address of the DeployVM. If you are deploying in an isolated network (e.g. using cross-over cable between your laptop and server), make sure the network between DeployVM and ESXi host is on the same network. PHOTON_GATEWAY and PHOTON_DNS - This is the Gateway and DNS Server for DeployVM. VCSA_IP and VCSA_HOSTNAME - If you do not have valid DNS in your enviornment which both forward and reverse is functional, then make sure both these variables have the exact same IP Addresss or your VCSA deployment will fail as it will try to resolve the hostname (FQDN) with the DNS server you provided. VCSA_WEBCLIENT_THEME_NAME - Defines the theme that will automatically be applied if you wish to customize the vSphere Web Client as described here. You can find the complete list of theme names here. Step 5 - Next, edit either create_sddc_deployment_on_usb_for_osx.sh or create_sddc_deployment_on_usb_for_linux.sh depending on the platform that you will be using to create the USB installer. You will need to edit the following variables at the top of the script which will point it to the download files you had performed in Step 3. Step 6 - The next step is to now use the create_sddc_deployment_on_usb_for_X.sh to create our USB insaller. Plug a USB key into your system. Please be aware, all contents on the USB key will be wiped after you confirm the USB key that is to be used to create the automated installer. First you need to identify the USB device that was plugged in to your system to make sure you select the right one. On macOS - You can run diskutil list and identify the device which should look like /dev/diskX. On Linux - You can run parted -l and identify the device which should look like /dev/sdX. Next, to run the script you will need to use sudo and pass in the device that you had retrieved from the previous commands. The script will automatically clear existing partitions and create the expected partition scheme. It will copy all the software packages you had downloaded from Step 3 and once it has completed, it will also unmount the USB device. Step 7 - The final step is to now take the USB key and plug it into your system and simply power it on. If you want to verify that things are working, you can connect an external monitor and watch the installation but I will warn you, it is pretty boring 🙂 If things are going well, you should see the ESXi installer stay on the "reading installation file" for quite a while as this is where the majority of the time is spent during the %pre section where it forms the vSAN datastore and copies all the files from PAYLOAD partition over to vSAN. Once ESXi has been successfully installed, which you can verify by observing it is on the main boot screen with an IP Address. You can open a browser to ESXi Embedded Host Client (e.g https://[IP]/ui) and login. Depending on when this is done, you may only see the DeployVM and/or VCSA being deployed. If you want to follow the remainder progress of the deployment, you can login to the DeployVM using the IP Address you had assigned it and the credentials is root/VMware1! by default. Once logged into the DeployVM, you can tail /root/script.log which will give you the progress of the VCSA deployment and configuration. Here is what you can expect from a timing standpoint from creating the USB Installer to plugging it into your system and provisioning the SDDC. From the testing I have observed in my personal lab, the USB Installer took 11min and the USB to SDDC deployment took 45min, which is from the time I plugged it into the NUC and powered it on to point where I can login to the vSphere Web Client of the vCenter Server. Obviously, YMMV depending on your hardware configuration. I would love to have multi-platform support and provide choice, however there’s a limitation w/Windows if you’re not familiar with it that prevents you from creating multiple partitions on a USB device (which is needed for this solution). There’s workarounds but that requires 3rd party tools and most don’t provide automation interfaces, so I wasn’t left with much choice. Now, you can still use the solution, but instead of having a script that automate the creation of the USB key, you will have to do that portion manually. first of all thank you for the great post. Please keep up the good work. Ok I have to correct my self github is also broken. Also Linux USB creation was OK (some errors on compilation though, I think I need to force gcc-4.8) but install failed on %pre% line 209, could not investigate more for lack of time (sorry about that). Don’t you need the DNS server to depl\oy and run the vCSA? Or is it unnecessary if VCSA_HOSTNAME is set as an IP address? Thanks for the reply. I’ll take a try and modify the Deploy VM to also act as a DNS server since I may want to change the vCSA IP after deployment. my vdq -q output is my actual output, after i altered the script in lines 136 and 142 with the actual names of my SSDs, so there is no mixup ;o) I also checked /var/log/esxi_install.log, but it only contains a whole copy the script, not the actual logged lines. I will reinstall the using my esxi6.5 (i also want to add the startech usb driver into installation, so i can use the usb ethernet nic from beginning). I will then post my vdq -q and the parts of esxi_install.log. this is getting logged a couple of times, always with the same input. If i try to grep through the log using some specific wording of you, like “largest” (seen in line 126), i only get this as a result, hard to get anything out with that. There is also no variables filled, so i cant see the number mixup, or even which disk is largest disk. as you can see, the smaller NVMe flash is used as capacityFlash. Eager to see NSX and vRealize added to the mix! As in can’t wait to see NSX, vRealize Automation, Network Insight and Log Insight into the mix! The log you’ve got doesn’t actually show me what the script has done. This is merely the parsing of the script 🙂 What I’m looking for is the actual output messages from these commands and easiest method is to just do grep VSAN-KS /var/log/esxi_install.log since all my messages a pre-fix with “VSAN-KS” and that should give us more info. I saw L70 a couple of days ago and tried to use it, as i thought, i could get my issue figured out alone. But if i activate debug by changing L70 to True, all i get is an error while reading the installation script (just after the installerboot is done) at line 259 (which is the end of python code). As i only have some basic python knowledge, i am not able to figure out, what is wrong, if debug = True. I just retried it with a fresh git clone and everything, same experience. Did you make sure to manually remove the vSAN Cluster and clean up the disks so they’re un-claim for each new run? and then delete the file systems using the webclient. i also used a live linux to remove all partitioning data in my tries. OK, here’s a python script (https://pastebin.com/wmk5jGU2) that you can upload to ESXi host and run which will walk through the exact same logic. It only does print statements. just tinkered again (and learnd a lot of python basics, by the way, thats great, too), the main problem is, that diskSize is a string, while using “>” as operator is tricky, so i added some conversions into it. basically i convert the string into an integer and on my logging back to string, so python won´t bug around with printing an integer. My guess is, that as a string the 1001562 is bytewise compared smaller than 114473. I already forked the project with my changes. I’m trying to install on a SuperMicro e200-8D and am running into an issue with the script. I get an error stating “error:/tmp/ks.cfg:line 260: “/.pre” script returned with an error.” When I press enter to continue another screen comes up and says “user-supplied %/.pre script failed. Error 256.” then another window says “The system was not installed correctly.” Pressing enter after that screen stops the install process then goes to a blank screen so I’m not sure how to troubleshoot the problem since there are no logs for me to view at that point. Any tips on how to resolve the issue are appreciated. I recieved the same error, did you end up working this issue out?